“Whisky, like a beautiful woman, demands appreciation. You gaze first, then it’s time to drink,” bestselling Japanese author Haruki Murakami once said. Indonesian whisky connoisseurs rejoiced when the iconic event “Toast The Macallan” returned to Jakarta for the second time from October 18 to 21. Founded in 1824, The Macallan was one of the first distilleries in Scotland to be legally licensed. Located in Speyside, The Macallan has grown into one of the world’s most beloved brands for single malt whiskies. “Toast The Macallan”, which took place at the newly established hotel The Westin Jakarta, included a signature 60-minute whisky experience, during which brand trainer Keith Nair and brand advocate Randall Tan shared some insights into the distillery process of The Macallan while attendees happily sampled some of the brand’s single malt whiskies. The event also served as a showcase to introduce The Macallan Double Cask 12 Years Old, which together with The Macallan Sherry Oak 12 Years Old and The Macallan Fine Oak 12 Years Old forms a trilogy collection of the same age statement. “It’s astonishing to witness more and more people being acquainted to whisky culture in this market,” said David Pattison, Commercial Director for Japan, India and Southeast Asia of Edrington, that owns some of the leading Scotch whisky and rum brands in the world, including The Macallan. “Riding on this momentum, we decided it was right to launch the Double Cask as part of The Macallan Trilogy of 12 Years Old. We hope that Toast The Macallan and the 12 Years Trilogy will continue to strengthen our relationship with Indonesian whisky connoisseurs in the years to come.” The Macallan Double Cask 12 Years Old has one very unique feature: it has been aged in a combination of European-seasoned sherry cask and American oak cask, giving it a very rich flavour. 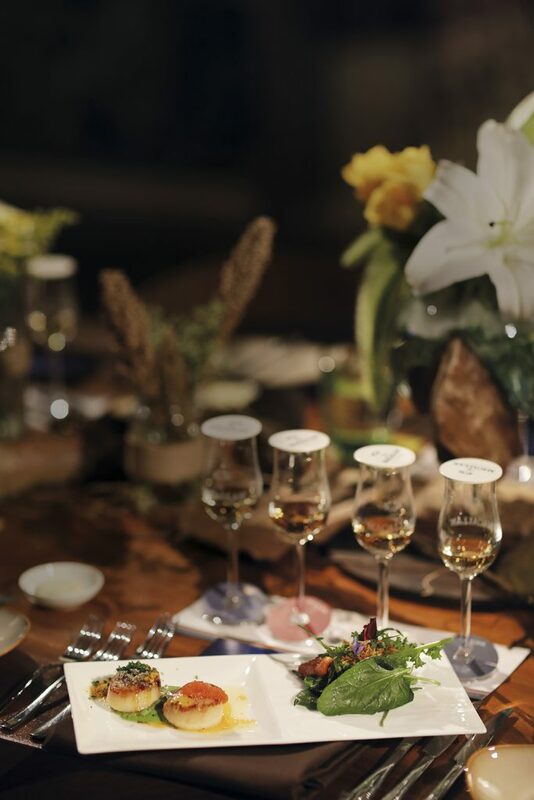 During a special dinner, which took place at the hotel’s Seasonal Tastes restaurant, four exquisite courses paired with different whiskies were served. Starting off with cured salmon served with kale puree and dill in a mandarin dressing, the appetizer was paired with The Macallan Fine Oak 12 Years Old, which carries a subtle citrus and floral flavour. Afterwards, diners were treated to lightly smoked scallops in a green pea and saffron sauce, complemented with deliciously smooth The Macallan Sherry Oak 12 Years Old. US Beef Short Rib, truffle mash, seared foie gras and honey beans made up the main course, which was served with a glass of the complex and woody Macallan Rare Cask. A splendid selection of desserts - chocolate ganache, vanilla espuma with candied orange and jelly, as well as ginger sponge and butter scotch honey comb - was the last course of the night, paired with the newly launched The Macallan Double Cask 12 Years Old. According to David Pattinson, he was overwhelmed by the positive response of Indonesians following the inaugural Toast The Macallan event last year. “In less than a week after the launch of www.toastthemacallan.id, hundreds of whisky connoisseurs have signed up, occupying the capacity of 1,700 guests over the four days,” he said.